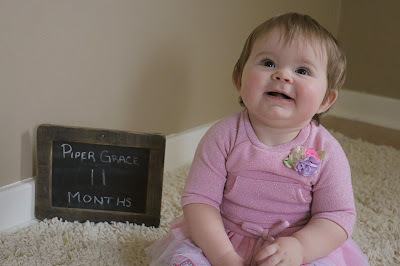 I guess it's finally time that I share Piper's eleventh month update with you (before she goes and turns ONE on us all). These eleven months with Piper have been the best eleven months of my life! 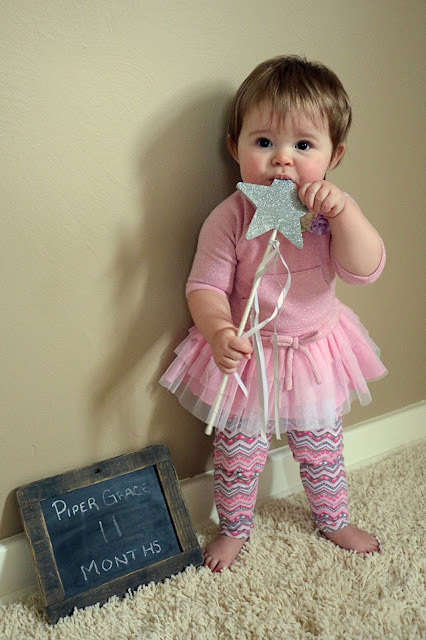 I've got no shame in admitting that it's been eleven months and I'm finally, finally feeling like I've got this whole being-a-parent thing down. I mean, I know I have plenty more to learn and that my role as a mom will forever be changing along with my daughter, but I feel like I don't have to say that I'm a "new" mom, anymore. That ship has sailed. At 11 months old, Piper is a peek-a-boo champion. She loves to sing with us and will dance to music by shaking her head back and forth. If you tell her to "give kisses" she makes the sound "mmmm". However, she's not too big on actually giving kisses. The only kisses she gives away freely are to the dogs, and she gives them away with an open mouth and her tongue out. Piper has 8 teeth now but at 11 months she only had 7. This 8th tooth, for whatever reason, has been the hardest on us all. I feel like we were checking every day for almost a month, hopeful to see if it had cut through yet. Teething is the pits! At 11 months old, Piper finally likes to be held/rocked to sleep, again. I am not exaggerating when I say that she hasn't liked to be held or rocked to sleep since she was 4 months old. She is such an independent little lady. Up until this month, Piper needed to be set in her crib and left alone so she could fall asleep. Nowadays though, she needs a little extra loving! It may have something to do with the fact that she's in her own room, now. More on that in the next update. I know that some parents might want to slap me in the head for saying this but, I am so glad that she is letting me rock her to sleep again. I feel like I understand just how quickly she'll be out of my arms (since I only had 4 months with her sleeping in my arms out of 11 so far) and I'm making sure to cherish every moment of it (no matter how bad it may hurt my back or how inconvenient it may be; it won't be like this for long and I'm loving this little "regression"). More recently, my husband and I have been having to walk her back and forth in our arms until she is almost falling all the way to sleep before putting her down in her crib. I love our little moments together before bed. I sing "you are my sunshine" to her every night, now. I love to watch her eyes get heavy and feel her little body relax in my arms as she begins to fall asleep. It's been so sweet having these moments back, again! Piper isn't walking quite yet (to be honest, we aren't really pushing her to walk), however, she does pull up to standing and walks freely all along everything she can. She has mastered sitting back down without hurting herself, too. 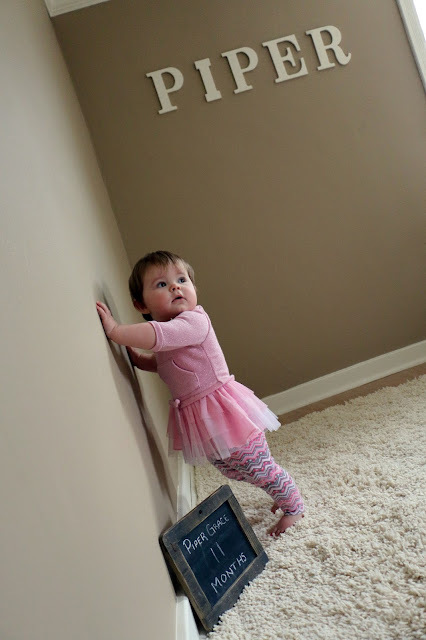 She is very cautious since we have all hardwood and ceramic tile floors. Learning to walk with no carpet is not for the faint of heart. 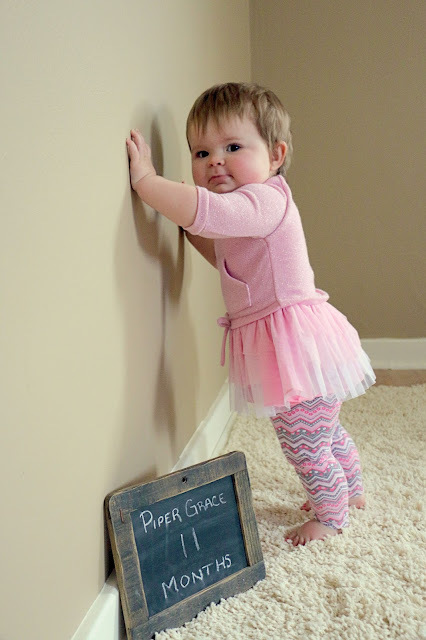 We aren't pushing it; she will walk when she is ready. 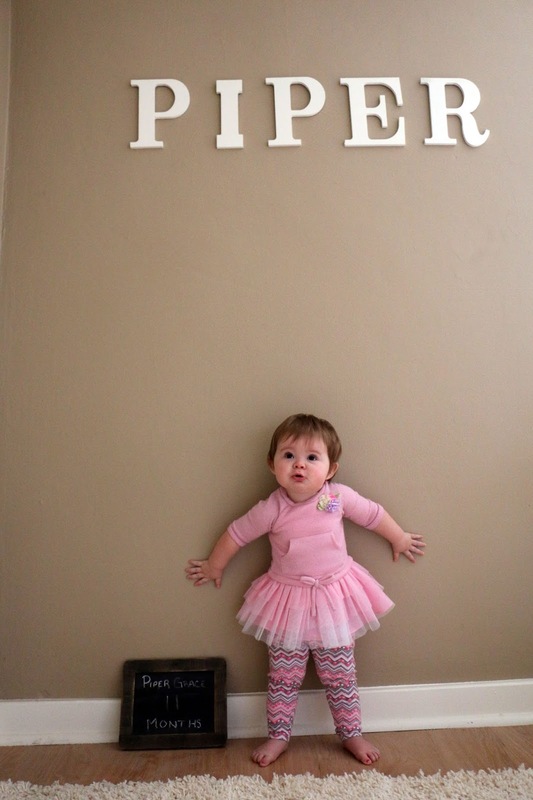 Piper is becoming a big copy cat these days! She loves to go back and forth with us, blowing raspberries, saying "ah ah" and clicking her tongue. She gets so excited when we copy her and she loves to copy us back. Piper is still rear-facing in the backseat of our car and so we will often test her by clicking our tongues to see if she will respond, or if she is sleeping. Piper has distinct favorite books and favorite pages of books. Piper's favorite book is "the ants go marching" and she's been laughing at a certain hippo in a zoo book lately. She laughs so hard every time we turn to that page. It's really fun! Piper loves to read! Reading is a big part of our night routine. We eat dinner, she gets a bath, we read books, she gets a bottle and then down for bed. Piper can tell us what the dog says, "argh argh", and also what a monkey says, "oo oo". 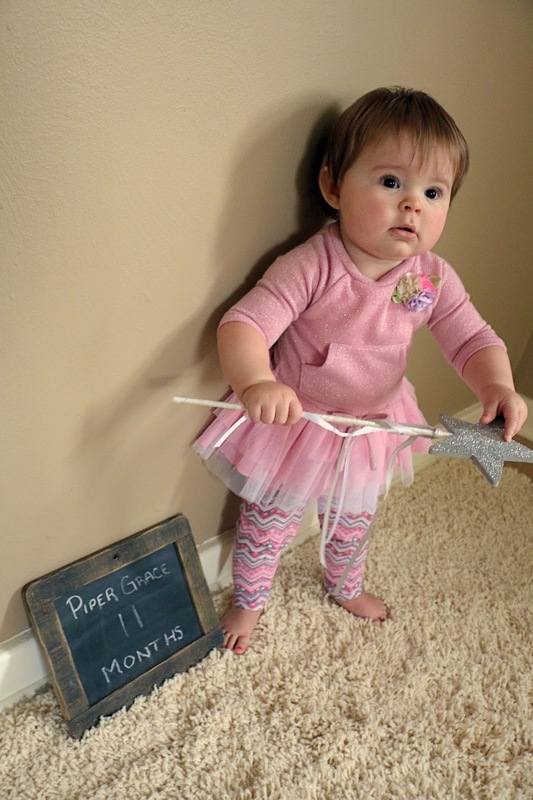 She also said her first intentional word the other day, but I will save that for the twelfth month update. 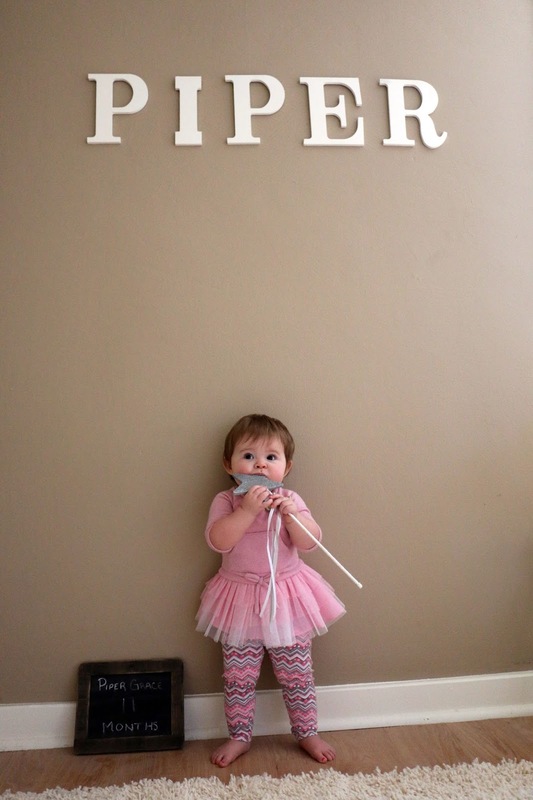 Piper Grace. You are such a big girl, but still small enough to carry in my arms. I love having you fall asleep in my arms; it's the best feeling in the world. When I sing "you are my sunshine" to you at night, I think back to when I would sing that song to you while you were in my belly. I love creating all of these memories with you, and while I am sad that you will no longer be a "baby", I am having so much fun watching you grow. I love you more than you will ever know. 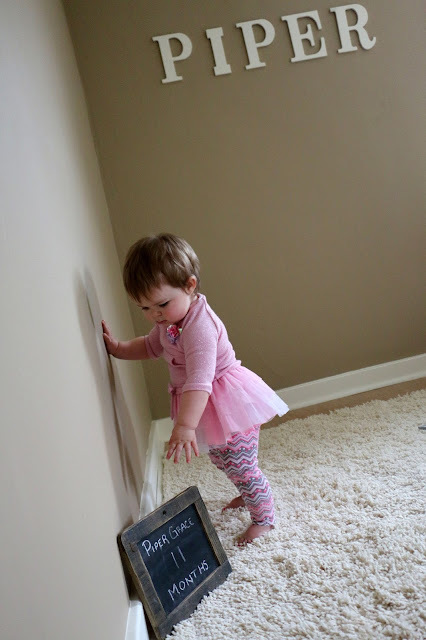 Such a sweet update :) My 2 didn't start walking until 15 months and 17.5 months, respectively... I was so ready for them to walk, but of course once they started, I just wanted them to stop growing up!